At the 143rd running of the Kentucky Derby on May 6th, an unexpected bombshell was dropped on the small army of photojournalists at Churchill Downs. Veteran editorial journalist Nick Didlick arrived toting a rolling case loaded with new Sony α9 mirrorless cameras and G Master lenses. Nick Didlick's cameras and lenses prepped and ready for the weekend at Churchill Downs. At an event like the Kentucky Derby, the actual race is only one part of the story. To capture the entirety of festival, Didlick set up his cameras for specific purposes. He explains, “I had six α9 bodies to work with. My plan coming into the race was to use four on remotes in various locations and two hand-held cameras, one with a mid-range zoom and one with a longer lens. Nick Didlick retrieves his remote cameras after the 143rd Kentucky Derby. “On my hand-held cameras, I had the new 100-400mm G Master with a 2x converter because I wanted to shoot head on. On the second α9, I had the 24-70mm G Master. I used that camera because where I was standing on the outside of the track, I was right up against the rails and I could look over and see all sorts of people and things happening right in front of me. I carried a 70-200mm f/2.8 G Master as well. “On Saturday, the day before the Derby, I walked around in the rain and made a plan for where I could put down my remotes. I had a couple alongside some of the other cameras and the rest in separate spots. On the remotes, I had three with 24-70 f/2.8 G Masters on them and one with a 70-200mm f/2.8 G Master on it. After days of heavy rain, the track at Churchill Downs was sloppy to say the very least. Nick Didlick sets up one of his four remote cameras, a Sony α9 with a 70-200mm f/2.8 G Master lens. Framing up for the shot across the line. Always Dreaming crosses the finish line at the 143rd Kentucky Derby champion with Jockey John Velasquez. Sony α9. Sony 24-70mm f/2.8 G Master lens at 26mm. 1/2000-sec., f/2.8, ISO 640. One in a sequence that photographer Nick Didlick shot handheld at 20 fps with the new Sony α9 (see the full sequence stitched together into a video below). Several of the horses, including Always Dreaming on the far right, are seen in mid air with all four hooves off the ground. Sony α9. Sony 100-400mm G Master with 2X converter at 800mm. 1/2000-sec., f/11, ISO 3200. A sequence of 30 full-resolution still frames shot by Nick Didlick with his Sony α9 at 20 frames per second were stitched together to make this video. 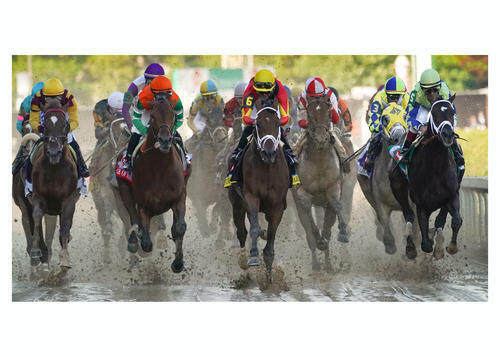 This Kentucky Derby was the Sony α9’s first major foray into big-time sports photojournalism. With Didlick’s guidance, the camera lived up to its potential. Kentucky Derby winner Always Dreaming with Jockey John Velasquez on the far right on a muddy day at Churchill Downs. Sony α9. Sony 100-400mm G Master with 2X converter at 600mm. 1/1000-sec., f/11, ISO 3200. Jockey John Velasquez raises his arm in victory after winning the 143rd Kentucky Derby with Always Dreaming. Sony α9. Sony 100-400mm G Master lens with 2X converter at 800mm. 1/400-sec., f/11, ISO 3200. No coverage of the Kentucky Derby would be complete without photos of the extraordinary collection of hats on display in the stands. Sony α9. Sony 100-400mm G Master lens with 2X converter at 800mm. 1/640-sec., f/11, ISO 2500. Nick Didlick took time away from the rail to find a quiet spot were he could photograph some of the fashion. Sony α9. Sony 100-400mm G Master at 235mm. 1/250-sec., f/5.6, ISO 3200. Sony α9. Sony 100-400mm G Master at 235mm. 1/250-sec., f/5.6, ISO 3200. Always Dreaming with Jockey John Velasquez after they cross the line at the 143rd Kentucky Derby. Sony α9. Sony 100-400mm G Master lens at 350mm. 1/1000-sec., f/11, ISO 3200.